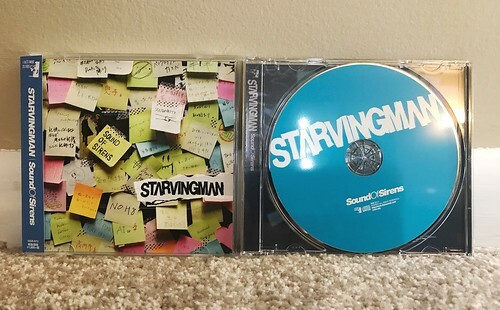 I picked up this Starvingman CD at the recommendation of Kazu from Waterslide records. He rarely steers me wrong and once again, he's shown me another incredible band that I don't think I would have found on my own. Now, I need to say up front that there are a few songs on this album, including on the opening track "向かい風" where there's some accordion and flute. In some ways it's kind of a nice incorporation of folksy melodies into modern punk. But in other ways it kind of sounds like the Dropkick Murphys and that's just not my scene. Luckily, the vast, vast majority of this album is top notch melodic pop punk. The riffs are punchy with just the right amount of palm muting that leads into giant sing along choruses. There are aspects that reming me a little bit of the poppier moments of Blew, but everything is a little bit slicker production-wise. The hooks are incredible throughout the album and in particular the title track "Sound of Sirens" and its immediate follow up "Do The Right Thing" (not the Leatherface song) are two of the highlights on this CD. This is the band's second album, so if anyone sees their first one, I need that.